Inspired by exciting true events in our history in the time of the American Revolution! Letters from the States came often and, sometimes, more than five at a time. Marines do love to get mail Not email. The real thing. Good old U.S. Post mail. Handwritten. Had to be. It was 2003 and Sergeant Leah Ann Sullivan read her mail every day, addressed to her 2nd Battalion, 3rd Marine Regiment, which was just south of Fallujah, Iraq. The mail was from her grandmother, with whom she was very close. One hell of a story was laid out in those letters. A love story in the time of the American Revolution. Leah never knew she had such history in her family. Leave it to Grandma, always so full of great stories. On Leah’s breaks from her duties, the letters brought her back to a time when America was young A time when the country was undiscovered and her ancestors had to protect Fort Henry and their colony. There was a lot to lose in the 1700s, around the Ohio Valley. Local tribes wanted their land back, and the British knew how to take advantage of that. Betty Zane was the girl who had to grow up fast on the frontier. She was raised by her four brothers. 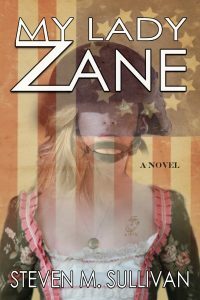 Her older brother, Colonel Ebenezer Zane, taught her how to protect herself, use her instincts, and shoot a long rifle. Then, Betty fell in love with Zach. Their love was immediate and deep. She never stopped loving him, even when she was forced to go to school in Philadelphia. All she wanted to do was to come home and marry the boy she loved, a boy who was becoming a man and who helped transform Fort Henry into Zanesville. Betty would find a way. But the Shawnee Warrior with the scar on his brow was out to take everything from the Zanes. He lost his brother because of Betty and her brother. He lost the respect of his tribe. He was losing his land. He found his opportunity with the British Captain Pratt and the American traitor George Girty. They were just as determined. They conspired to take down the Zanes and Fort Henry. But they threatened the wrong girl. A girl who was becoming a woman, who loved her man and her country, and would do anything to save them. The letters told Betty Zane’s story well, and Grandma knew what she was doing. The stories stirred something within Sergeant Leah Ann Sullivan at just the right time. Her Captain has assigned her to lead a mission. A “Red Eye Op.” Now it is her turn. She is about to find out just how damn tough she is. Who is the ruthless enemy in the dark of the Iraqi desert, taking out her fellow Marines? Who are the two unknown soldiers who have compromised her team? Will she have the time to tell the Marine named Vargas how much she cares for him? With her Captain’s faith, and a team who has put their trust and respect in her, Leah is about to embark on her own journey. A journey of self-discovery and intestinal fortitude, and high risk. One that takes us to the ending of a true story, about a female warrior in the past that will forever change who this warrior is in the present. His body was completely submerged. His red-brown skin glistened with the reflection from the water. A dark black mane of hair was slicked over his mostly shaved head and floated behind him. It was hard to tell if he saw them. He was was treading to the other side. They had to move fast, whatever they decided to do, Betty knew. She grabbed her brother’s arm and motioned to the woods next to the far bank. Two more Indians stood close to the trees staring in their direction. They looked like scouts from one of the local tribes. Could be Shawnee, Cayuga, or another Iroquois tribe, Betty thought. They had animal-pelt wrapped shins and loin cloths tied tight above their muscular legs. Mostly bald, feathers, were tied in what little black hair they had coming from the tops of their heads. They stood still and blended with the trees. Whatever tribe they were from, Betty knew the possible consequences of coming into contact with Indian scouts or warriors. Her brothers always taught her what to do to avoid any close contact with them when she was far from home. Some of the local tribes seemed to get along with the new colonies, but others, she had heard, did not like the settlers staking their home on their lands. Leah had never seen warriors dressed like these were. She had never seen warriors with these kind of eyes. She was reminded of the story of her older brother Isaac, who was kidnapped by the Wyandot at a young age, who thank God had been smart enough to learn their ways and eventually marry into the tribe—but that was a good story. Other stories of children disappearing in the forests and plains, taken by certain tribes and never being heard from again were more common. Yes, she had always remembered well. Her brother Ebenezer told her the stories on the porch after breakfast. He was a colonel, with a lot of experience fighting Indians, and he loved her too much to lose her. He swore to protect her to their parents, who were making their way south from Virginia to their new home near the river. They were too far from home to run. They would be overtaken, even though the scouts were across the bank. The Indians looked lean and strong, and the tribes always sent out the fastest and best warriors to scout the settlers and hunt near the river. The Indian in the water was making his way closer to the the bank. The other two started moving south, with what looked like bows. The warrior on the left loaded an arrow into the bow. Betty moved in full view and stood waving at them. The warrior in the water stopped swimming. The two on the other side froze and stared. He drew his long-barreled rifle. Long-barreled rifles were exactly that, long. Made so for accuracy. They had spiral grooves in the bore. Some were smooth, but Jonathan like to carry the one with the rifling. He made this choice before every journey from the main house. Betty knew this gave him a secure feeling. Good, long range and accurate. The lead balls fit tight, and this made for longer load times, but it was worth it. Betty always agreed on this choice too. Jonathan kept his rifle clean to prevent fouling. Even so, it was a risk to have multiple firings. A risk they had to take. Jonathan ripped the paper open with his teeth and signaled Betty back to him. She knew what she had to do. She had practiced this with her brothers many times. The Indians still did not move. They were having a discussion. This was good, but most likely they would be done talking in thirty seconds. Betty poured the powder in the pan of the lock. She settled into a routine. She controlled her breathing, even though her adrenaline wanted her to rush. Jonathan already had a grip on the wooden stock and poured more powder from an animal horn into the end of the barrel along with a lead ball. Betty snapped the lock shut and handed Jonathan the rammer. He rammed the load after pouring some more powder into the end of the rifle. Their movements worked exactly in tune with each other. They were very fast. Jonathan crouched and crept up to a good spot. Betty figured the two Indians on the bank were the first her brother would fire at. They were in the open. A smart choice. The shot echoed in the still air. The two warriors on the far side stood wide-eyed. A moment of shock, Betty thought. The one on the left took the lead straight in the chest. The thump of impact was like a hatchet hitting a tree stump. He was dead instantly. Betty and Jonathan repeated the loading process. She slid down next to him with powder and ball ready. He was already ramming the next load. They didn’t look to see the reaction of the other warrior who was dragging the body behind a tree. They didn’t look to see the one in the water who, instead of turning back, was making his way across to the near bank. He would be there in minutes. The next shot was to the head. Research on our family tree revealed a female war hero in the American Revolution. While the facts were true, as I researched more in depth, I found so many untold stories of female war heroes and decided to weave a story about two women linked by generations, who both fell in love and both helped save our country in two different timelines. The hero in the past inspires the one in the present.